Recently there has been a lot of chatter on various denier blogs about the notion that global warming stopped in 1998. Moreover, I am finding that thoughtful, well-read individuals who generally accept the concept of anthropogenic climate change are hoping that warming has peaked and that the planet will soon begin to cool. 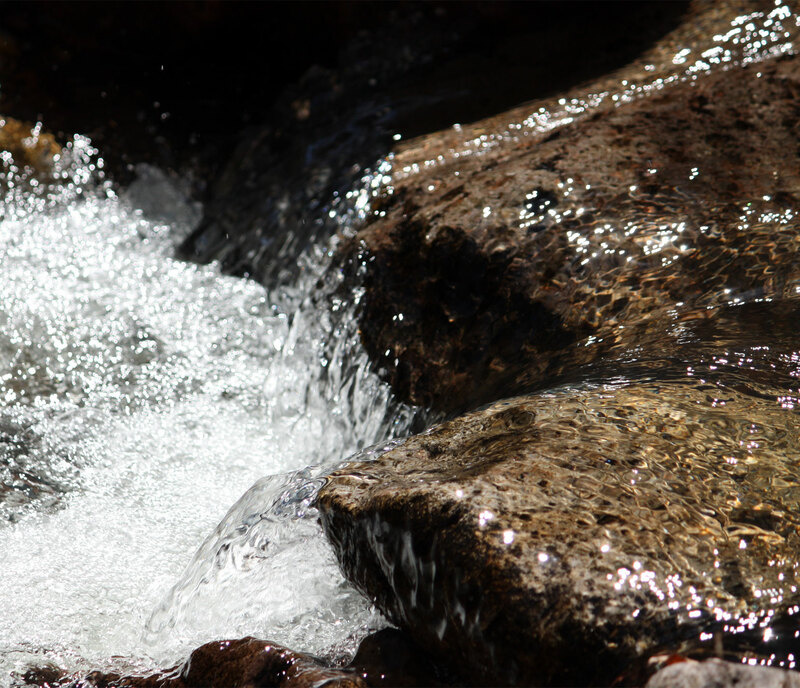 Usually some unspecified “natural cycle” is identified as the cause of this cooling. This meme seems to be gaining traction with a growing cross section of the public. This article in The Daily Mail is typical of the logic behind this idea, and the figure below from Gavin Schmidt at RealClimate provides what appears to be compelling evidence to support this claim. 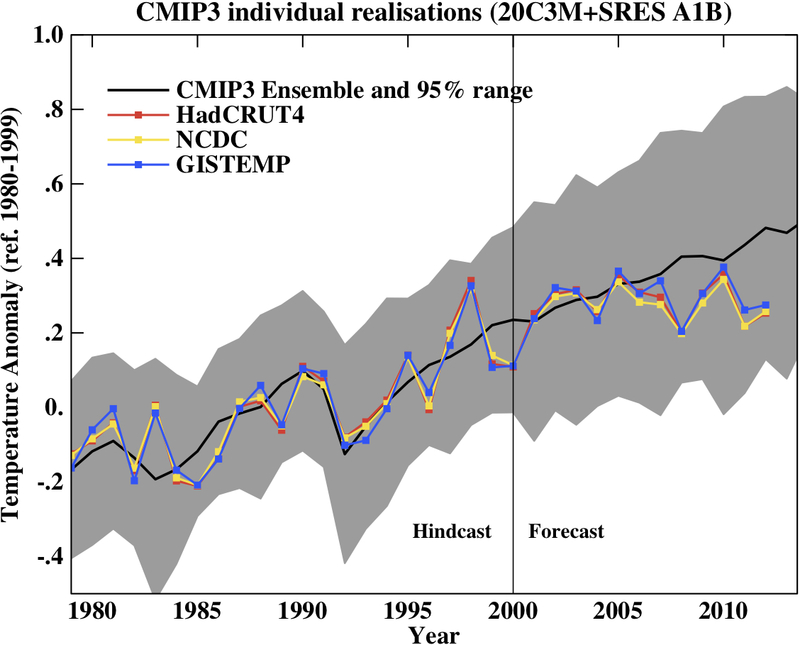 The figure shows annual mean global surface air temperature anomalies from models (CMIP3) plotted against actual data from the Hadley Center (HadCRUT4) in the U.K., NOAA (NCDC), and NASA (GISTEMP). You can see that there has been no apparent net increase in surface temperatures since the late 1990s. Note that this figure provides a finer scale for understanding the year-to-year variation than we see in the typical long-term plot of temperature anomalies. The most recent of these long-term analyses is seen the figure below. Here we can clearly see the long-term trend to higher global surface temperatures. Note that this graph shows a 10-year moving average, and thus the net stasis of global temperatures seen in the previous graph is not apparent. There is little doubt that the surface of our planet has warmed about 0.8-0.9oC since 1950. More importantly, the most recent decade or so has been the warmest in recorded human history. I sincerely wish that the observed stasis of global surface temperature did indeed mean that global warming has ceased. Unfortunately, there is compelling evidence that global warming has actually accelerated. In reality, the energy imbalance of our planet is more extreme than ever. In order to understand how the surface temperature record can stay relatively constant during a period of accelerating global warming, it is necessary to realize that the excess energy retained in the lower atmosphere by the greenhouse gases is largely absorbed by the oceans. In fact, the oceans absorb 93-94 percent of this energy. The figure below (from Nuccitelli et al. 2012) illustrates the differential change in total heat content at different depths of the ocean relative to the land, ice, and atmosphere. The apparent stasis of warming is occurring primarily in the latter compartment, especially in the atmosphere. Modeling of ocean mixing indicates that heat is mixed between upper and lower strata of the ocean in pulses. This is shown during previous “hiatus decades” when measured ocean surface temperatures did not show net warming. Recent studies have shown that we are currently experiencing such a hiatus. Hansen and colleagues in a classic paper in Science in 2005 demonstrated that energy equilibration between the oceans and the atmosphere requires about 40 years from any given starting point. The energy imparted to the oceans undergoes mixing at the same time as the surface heat is equilibrating with the atmosphere. Thus, it is not surprising that as heat is distributed to lower depths, there are periods during which atmospheric warming stalls. The figure below (Meehl et al. 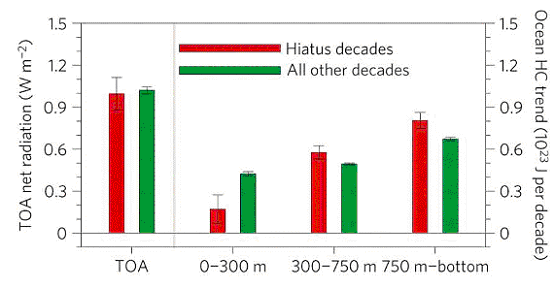 2011) shows that hiatus decades are associated with redistribution of heat to depths lower than 300 meters. TOA in this figure refers to “top of the atmosphere,” and this is the touchstone for understanding the Earth’s overall energy imbalance. When at equilibrium, the energy coming into the TOA from sunlight, and that exiting primarily as long wave Infra Red energy, must be equivalent when all sources are accounted for. The Earth’s systems of water, land, ice, and air are way-stations that hold the heat that is received from the sun, and this dynamic storage of energy (i.e., “capacitance” similar to that of an electrical circuit) produces surface temperatures that are generally compatible with living systems. The troposphere (the layer that we live in) has expanded in height upward as greenhouse gases and other sources of warming such as black carbon (soot on ice) have warmed the air and it has expanded. This warming has also caused the tropical latitudes to increase in extent several degrees north and south latitude. Presently, the troposphere has expanded upwards a couple hundred meters or so relative to pre-industrial times as a consequence of progressive anthropogenic warming. 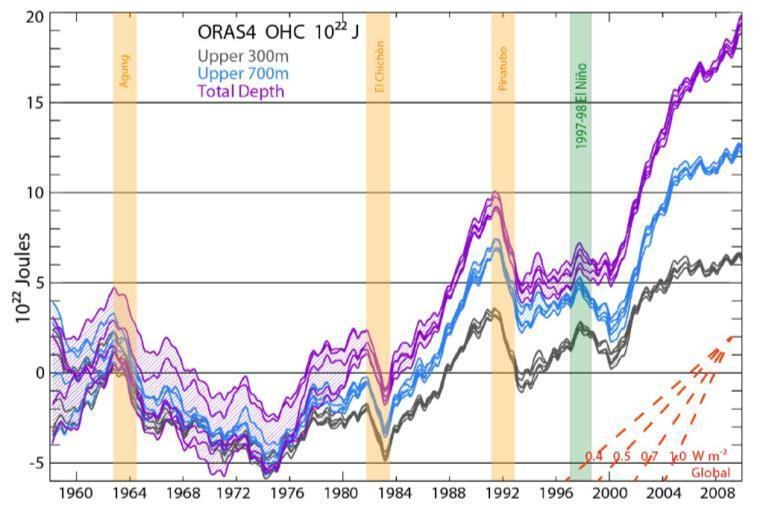 Recent evidence shows that ocean heat loading has indeed been accelerating, even as the surface temperatures are holding relatively steady (Balmaseda et al. 2013). 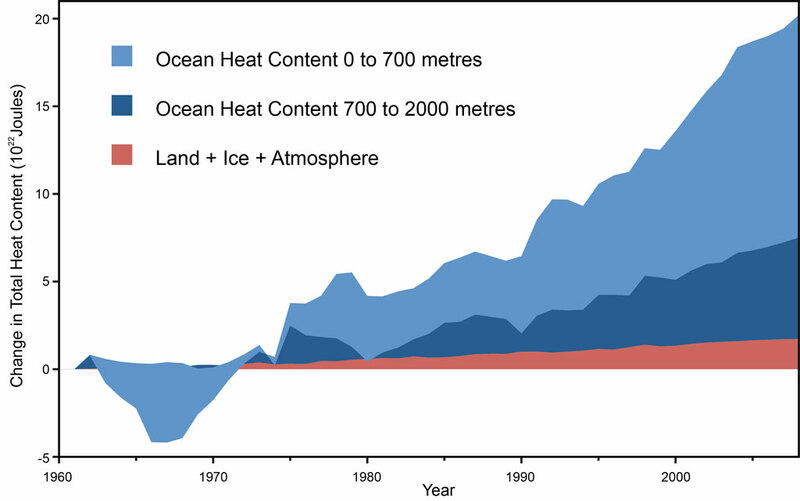 The figure below shows the rate that ocean heat loading has been increasing at all depths since the late 1990s. The overarching take-home message here is that any single indicator of the energy content of any of the Earth’s systems of water, land, ice or air is a consequence of multiple forcing factors. The typical way to show the impact of large-scale forcing factors on surface temperatures is show in figure below from the IPCC. Note that some components warm the surface and others cool it. In turn, each of these forcing components is also the result of multiple factors. In the case of the surface temperature, the evidence is clear that the oceans are playing a large role in driving the temperature of the lower atmosphere, but the bar graph here leaves this out and focuses instead on long-term drivers of surface temperature change. It should be clear that a single graph of global surface temperatures does not tell the whole story of the energy balance of our planet. Accordingly, no single indicator can be used to falsify global warming. The bottom line with respect to the 16 years of apparent stasis in surface temperature record is that multiple lines of evidence indicate that anthropogenic warming and the overall global energy imbalance have continued unabated and even accelerated over this period. Thus, global warming is truly “global”, and this includes the various independent forcing factors and storage compartments that can influence surface temperatures over the short run. Kevin Trenberth at NCAR has stated, “sooner or later this heat will come back to haunt us.” Indeed, I expect the next decade to be a wild ride as climate disruption is more fully expressed as ocean heat equilibrates with the atmosphere. Previous postGenerational impacts of climate change: What will it mean for you?